Last night was shopping night at Ben Franklin Crafts. I started by first looking at the Martha Stewart sections to see if I missed anything. I found the ribbon organizer and picked up one in a pretty aqua color. I hope it doesn’t get too dirty because it is covered in a fabric, which looks like it will soil easily. Maybe I should Scotchgard it. The ribbons in the collection are on rolls designed to fit perfectly in the ribbon holder. Don’t be like me a start tearing off the paper ends of the ribbon rolls. You’re only supposed to cut the corners off the cardboard ribbon rolls and they will roll nicely. I also purchased some rubberstamp sets. They come in pairs on wooden handles for $9.99, which is reasonable for such large stamps. I understand the bird sets are based on state birds. Both the leaf sets and bird sets seem to be selling well and I was disappointed that some of them were completely sold out. I am planning to stamp (with fabric ink) on some Martha Stewart plain dishtowels and embroider the designs. If they turn out well, I will show you a sample. Although, I didn’t think the paper punches were particularly attractive, I decided to buy some to see if they are superior to other brands. I thought the oak leaf punch was cute. I also bought some more glitter in autumn colors this time. By punching out the leaf from vellum scraps and running them through the Xyron sticker maker, I was able to make some stickers. I rubbed the stickers with various autumn glitter colors (on each leaf) and I then ran the sticker with the glitter side up through the Xyron sticker maker again. I ended up with some pretty, sparkly glitter leaf stickers. The punches were easy to use but not really different from others I already own. Tomorrow I will play with some of the Christmas clear rubber stamp sets (Hero Arts) and see what I can create to show you. Not being able to find all the glue and the seal that shot out of the tube of glue (see Sept.24 blog) has been in the back of my mind for a few days. Today, I decided to rearrange and clean up my craft area so I’ll have more working space and just in case something else goes airborne it won’t be impossible to locate. I guess everything happens for a reason. While doing some initial packing and moving I discovered some great stuff, like a bag of sea glass and dimensional paper paste…how could I have been so careless with things that have so much craft potential? Just getting this small area in order is going to take several weeks but hopefully it will make me more productive. With fall already here, but the newsletter a couple of months away, I decided to post a couple of project instructions on this website to get you in the Spirit of Autumn. 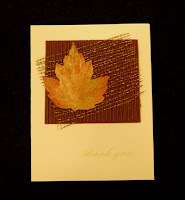 I’ve already talked about them in the Sept. 23rd and 26th blog entries….the flocked Halloween Place Cards, and Autumn Jasper and Pearl Necklace. I hope that you’ll try making these projects or invent one of your own. There’s something about knowing it’s the fall season but not seeing any signs of it in our neighborhood that makes me want to craft something autumnish. When I saw the golden pearls sticks and the autumn jasper beads at Ben Franklin Crafts Bead Shoppe, I knew that they would make a great necklace. Because the pearls were so outstanding I wanted to let them be the focus. I also felt that putting too many pearls in the necklace would diminish their beauty. I hope that you’ll agree with me that this necklace really captures the glory of autumn and yet it is subtle enough to be wearable with many fall outfits. The pearls were from the latest shipment to the Bead Shoppe. There were so many beautiful strands that I know I’ll be going back to buy more soon. I’ll try not to buy them all before you get there, but you better hurry! The necklace was simply strung on gold colored beading wire and the clasp fastened with a crimp bead. All the findings are gold-filled but you could use gold plate findings too. Make yourself a piece of autumn jewelry to celebrate the season. Not much crafting going on here today. I did discover two things. One was a good thing; one was not. First, the good thing…..the Martha Stewart die-cut impressed autumn leaves can be painted with the Lumin Arte Twinkling H2Os to yield beautiful results. It’s nice to be able to decorate like Mother Nature and add sparkling autumnal colors to the leaves, especially because here in Hawaii we really never see the seasonal changes. (See photo. Click on image for larger viewing) Now this is the ‘it’s not a good thing’ part of my day. I was testing the various glues in the Martha Stewart line. I found the glue pen to be excellent. The small ballpoint tip applicator allows for delicate gluing. When working with flocking, I have found that the ballpoint glue pen is perfect for filling in ‘bald spots’ in the design being flocked. I think the pen might be good for tracing over rubberstamped words for glittering or even for handwriting and glittering personal messages. Anyway, when I got to the all-purpose gel glue I had trouble taking off the inner seal. I poked and pried but it wouldn’t come off. The tube of glue is soft, so as I was struggling I was also grabbing the tube tightly. All of a sudden, the glue tube exploded, sending glue all over my craft room. What a mess! I’m still not sure if I cleaned up all the glue because it’s clear and I never found the seal that caused the problem….it’s probably stuck to the ceiling! Perhaps there was never a seal and the glue had just dried over the top. Maybe this experience is a reason to keep my craft area neater…..but it’ll never happen, at least not in this decade. I must finish the newsletter and stop getting distracted by all the fun stuff in my messy (and now gluey) craft room. I’ve started trying out the new Martha Stewart craft items. The double-sided Halloween s tickers are a bargain because there are 10 sheets (with about 25 stickers each) in the package. They are a bit difficult to separate from the backing but work well with black flock (Stampendous Fun Flock). (See photo. Click on image for larger viewing.) I cut the half circles of the place cards with a Coluzzle circle template. Because the cookie box was rather plain, I embellished it with the floral double-sided stickers and glitter. I wish the glitter came in smaller bottles because of the cost and storage space. On the other hand, the bottles have caps that work very well to dispense a little or a lot. I even tried the cookie recipe (that came with the box set) and the cookies came out looking just like the ones in the picture on the kit box. The cookies were good, maybe because I added nuts and toffee bits. Tomorrow I’ll try to finish the newsletter, but I don’t think I can resist playing with the new craft items. Yes! The Martha Stewart stuff is now for sale at Ben Franklin Crafts! The Hilo store has a pretty extensive array of her craft products. I guess the most striking thing about the Martha Stewart line is the color palette and simple designs. The products are generally in quiet pastels, sort of New England or Cape Cod colors. Everything has a clean line, some with an Asian or Scandinavian look. I think Ben Franklin Crafts is the only store in Hawaii to carry the Martha Stewart craft line. I am addicted to ribbons so of course I bought lots of rolls of two-color metallic, adhesive-backed printed satin, and Baker’s twine. I also picked up vellum and dimensional stickers, monogram and thank you stickers, card and box sets, beautiful accordion albums, library card pockets, yummy colored glitter, three kinds of glue, and lots more. I went crazy! The Hilo Ben Franklin Crafts also had some seasonal Halloween Martha crafts…..double sided adhesive stickers, ribbons, and rubber stamps found their way into my cart. Now, I just need to figure out who will appreciate a Halloween greeting. I have lots of ideas and will soon post some of the projects I finish with the Martha supplies. Besides being a great shopping day……. the Bead Shoppe had some bargains on gorgeous pearl, shell, blister pearl, and gemstone strands…….I also had success on a project that has been on my mind for quite awhile. It started with a few Raku Beads….not enough to even make a bracelet, but too pretty to pass up. Anyway, sometimes when I can’t find a solution for a craft problem I just leave it nearby and think about it every time I pass by. Finally, after months of walking by the beads seemed to speak to me and I knew what to do with them. As I was almost finished with the necklace (it only took 1hr.) I had a problem with the closure. I had planned to make a sliding Chinese style knot finish but the cord I used was too slippery so I considered making a standard s-hook but that didn’t seem right. The final outcome was one I had seen in a magazine and worked out well because I had one ceramic bead left. I rarely have project turn out just right because I’m a bit of a perfectionist when it comes to crafts, but this necklace came very close to being what I wanted. It matches my new blouse, too! I’m pretty certain the fourth project for the upcoming newsletter will be a beaded ornament. My only concern is that three of the four projects contain beads, so I may still make a change if I come up with another suitable project before the printing deadline. Last night I went shopping at Ben Franklin Crafts, hoping to see the new line of Martha Stewart craft items, but they were still on the floor in boxes. I guess I’ll just have to wait to see what the store will be stocking. I did purchase some of the Martha Stewart craft products while off-island (before I knew local Ben Franklin would be carrying the line). I hope the store will be stocking the liquid ballpoint glue pen because it is the best I’ve ever used. It’s great for intricate gluing (glitter, flock, etc.). What I did buy last night were lots of the $1 L’il Stamps and clear acrylic blocks. Such a bargain…you’ve got to check them out before they’re all gone. I also bought some Christmas items to start making gift bags etc. No, it’s not too early to start because having a stockpile of wraps, tags, etc. will make the holidays go smoothly. (See photo. Click on image for larger viewing.) It took just a minute to Fabri-Tac down cut pieces of wide ribbon to a candy striped bag and close it with the cute Santa clothespin. The ribbon was really amazing because it changed from shiny red to green when I moved it from side to side. I think the ribbon is supposed to be used as a garland for a tree but I will get more mileage from it by cutting it up and using it to embellish cards, bags and boxes. The ribbon was a bargain too, because the roll was gigantic! Today, I die-cut some plain beige washi paper (the course one) into tag shapes. I used the Big Shot and Sizzix tag shape but you could use a Marvy tag punch. 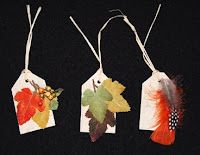 The washi paper is just the right texture to use for Thanksgiving name tags and looks great embellished with artificial fall leaves or autumn colored feathers. (See photo. Click on image for larger viewing.) Try writing your guests’ names on the tag and tying them around a napkins with a piece of raffia to give a special touch to your Thanksgiving table. By the way, have you started making your entry for the Craft Club Tag Contest. The deadline is Nov. 1st and we’ve already started getting entries. Look at the last Craft Club Newsletter for contest details. We are working hard to get the shopping website going and the blog set up so you can send me your comments. Last night I found a 75% off sale for boxed plain thank you cards. They were good quality items, which I felt just needed a little embellishment to improve them. A nearly blank card and envelope for 30-35 cents is a crafter’s dream come true. 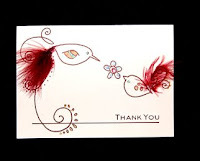 Today I used Versa Magic Jumbo Java ink and my Stampendous unmounted bird and flower set to print on a pink card that already had the words ‘Thank You’ in brown. After arranging the design on the acrylic block to fit the card size, I printed a test and then several more. Once the ink was dry, I glued on real maroon colored feathers, added Stickle and rhinestones. I am happy with the results but even happier that I have so many more cards to decorate. (See photo. Click on image for larger viewing) I bought lots of boxes and at such I low cost I don’t have to obsess about wasting a few on trial tests of crafting techniques. Next time you see a sale on plain cards buy some because you’ll have fun embellishing them and end up with lots of cards, maybe enough to wrap up and give to someone special. So watch for bargains in crafting fun…. Wow, the week just flew by and happily I made more progress on the newsletter projects. I’ve completed two more projects, a gemstone chain earring and a reversible ocean-inspired necklace. I hope you’ll make them for yourself or holiday gifts. It’s a challenge to design the projects because I need to incorporate materials from Ben Franklin Crafts, work ahead seasonally, keep a watchful eye on publication deadlines, make the project desirable and yet doable for most crafters, be sure that the project photographs well in color (for the website) and in black and white (for the newsletter) and carefully word the instructions/draw diagrams so they can be followed. It’s amazing how many projects get rejected along the way as I try to present the best craft projects for our craft club members. I have often thought of compiling past projects into a booklet, but craft trends change so quickly and suppliers to the store don’t stock some items anymore. Making a project book would be a gigantic challenge. Although I could go on and on about what I hope to do, I do need to work on the newsletter because I will be going on a short vacation and the deadline will still be there when I return. Today I am thinking about the approaching New Year (2008!) so I may write about resolutions. Oh, good news! We are a step closer to our online shop of Extra Goodies.